PowerPoint is a formidable tool for today’s creative content authors. The array of formatting and effects tools is simply stunning compared with early incarnations of the World’s favourite presentation platform. But there are some things you might find you want to do and can’t. Text is a great example. Since PowerPoint 2007 it’s been possible to edit many aspects of text such as filling it with complex gradients, changing outline colors and weight, and adding effects such as shadow, reflection and glow to name just a few. One thing you can’t do is convert text to an outline like you can in Adobe Illustrator. 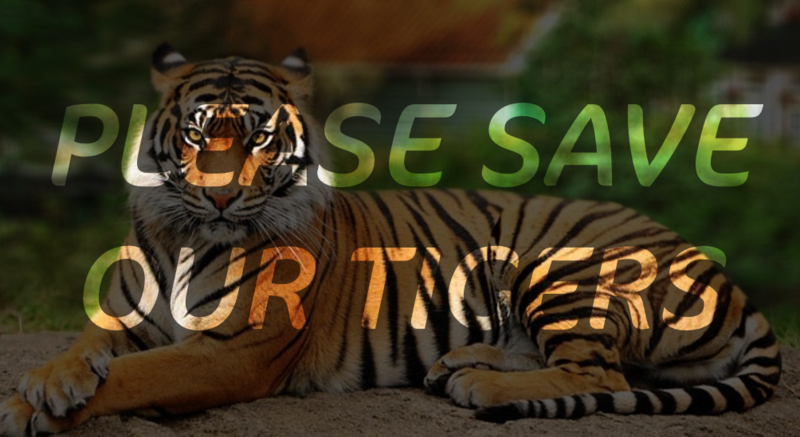 But what if you wanted to do the inverse by making the background stand out through the text? To do this, you need to convert text to an outline and then do a couple of extra things to ‘subtract’ it from the semi-transparent rectangular black shape. PowerPoint provides some Transform tools to distort text but what if you just want to stretch text independently in the horizontal or vertical direction? If you’re already familiar with soft edges you’ll know that you can apply this effect to shapes to make them ‘float’ more naturally on the slide but you can’t apply soft edges to text. At least not until now! Finally, you may just want to do something as simple as make sure the recipient of your presentation receives and sees it the way you intended. 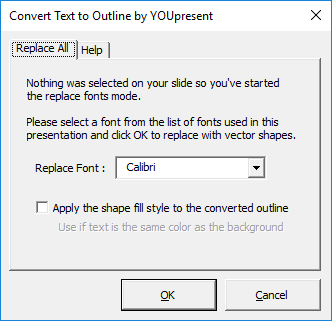 PowerPoint includes a feature for embedding fonts in presentations which is very useful but sometimes, this is an overkill if there’s just one word in a special font that you’ve used. Converting that little bit of text to a vector shape is a much more efficient way to guarantee portability while at the same time preventing the text from being edited. What does Text to Outline do? 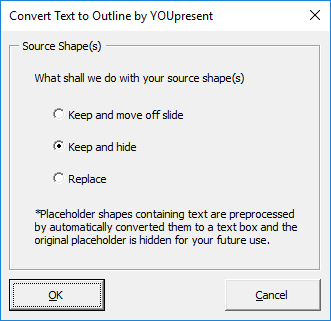 Once you’ve installed the add-in, you simply select a shape containing text and click the convert button or select nothing to process all text across a presentation. If you choose to, your original text is kept and a new shape outline of your text is created. Because they both look the same until you start editing the text, we’ve selected to show the shape points on the example converted text below. NEW! From version 1.5, placeholders are now supported but they need to be converted to text boxes first. Your original placeholder is maintained and we just simply hide it on the slide for you. We love PowerPoint. And sometimes, we just like to give something back. That’s the first reason and no, we don’t spy on you or mine any personal data, period. The second reason is that because the way PowerPoint works and more importantly the available programming tools folks like us use to create add-ins, conversions are not 100% accurate. For example, you may see small deviations in reflections and we can’t transfer picture fills from your text to the newly created outline. Supporting this complexity is costly so we decided to give the add-in away without any support. Finally, we dropped a couple of hints into the add-in about other paid-for products that you may find interesting. If you like it, why not share our love and share this page using the links below? * the add-in will install with these versions of PowerPoint but you will not have access to the main conversion feature as Microsoft didn’t develop the required functionality until Office 2013. As of version 1.53, Text to Outline is supported on PowerPoint:mac 2016 with the same features as the PC version. So how do I get Text to Outline? Well, because PowerPoint continues to improve, the first thing to note is that the main feature works with PC versions of PowerPoint 2013 (Office 365) , 2016 and later. The Windows version of the add-in will install in earlier versions such as 2010 and 2007 but you won’t get access to the full functionality. Next, just click your preferred download method below and install it as you would with any other Windows application. For Mac, the add-in is installed manually but is pretty simple. Once installed, a single Text to Outline button will be added to the Home tab in PowerPoint. To start using it, select a text box, placeholder or shape containing text on your slide and click the button to convert it. Tweak : in Keep & Hide mode, the source shape no longer moves off of the slide (its position is maintained). Tweak : a help tip icon has been added to the mode window to show how to unhide the source shape(s). New clearer icon added with support for Mac Retina screens. Thank you to Nolan Haims Creative for providing this. Mac version (for PowerPoint:mac 2016 only) now supports the same features as the PC version. Added the ability to process multiple text shapes across an entire presentation.